In an interview with the New York Times Prime Minister asks Europe to help Greece change – Promises the latest round of austerity cuts will be the last. New York.- Prime Minister Antonis Samaras has ruled out all possibility that Greece might leave the euro in an interview with the New York Times published on Saturday. “There is absolutely zero risk that Greece is leaving the euro,” Samaras told reporters Rachel Donadio and Liz Alderman. At the same time he noted that euro-membership was coming at a higher political and economic cost, which had led to violent protests and mass demonstrations in Greece, Spain and Portugal. The article emphasises the magnitude of the task facing Samaras as the Greek economy unravels and the difficulties that the Greek premier must negotiate, not least whether Greece’s creditors will agree to sign off on the package of austerity cuts finally agreed by his coalition government and release much needed financial aid that will grease the wheels of the country’s stalled economy. The Greek premier insisted that the latest round of austerity cuts will be the last and will be manageable if Greece’s creditors allow the government to put them into effect gradually over four years, extending the loan period until 2016. “While few Greeks seem to believe him — and many are upset at a corruption scandal now embroiling his New Democracy party — he contended that the measures could be manageable if Greece’s creditors allowed them to be put into effect gradually over a four-year period rather than all at once. The lenders have already given an indication that they are ready to accede to his request. The last part of the interview focused on the issue of illegal migration and the rising anti-migrant sentiment among ordinary Greeks that helped sweep nationalist Golden Dawn from the edge of the political wilderness straight into Parliament. Samaras described the “waves of illegal immigrants” arriving in Greece as a major problem that would get worse if the situation in Syria deteriorated further. «In the interview, Mr. Samaras said “waves of illegal immigrants” were sweeping Greece, a “major problem” that would worsen if Syria imploded and more refugees entered Turkey and then Greece. “Illegal immigrants have taken over Athens,” he said, causing a “public health problem” and a rise in crime», the ΝΥΤ says. But he appeared confident that Golden Dawn was a “bubble that would burst” without the need for “extreme measures”. He said he did not believe in outlawing the extremist group, which has voted with New Democracy in significant parliamentary votes. “I believe democracy is so strong you don’t need to take extreme measures,” Mr. Samaras said. Prime Minister Antonis Samaras stressed his confidence that Greece’s European partners will continue to support the country, in an interview granted to the Greek Sunday supplement ‘Vimagazino’ released this weekend. “Europe will vote Greece. The partners will see the changes being carried out. We are sending the right messages and restoring the country’s credibility,” Samaras said, predicting that things will get better. Regarding the latest package of austerity cuts agreed by the party leaders in the coalition government last week, the prime minister emphasised that the package had to be finalised and voted on in the space of a few days in order for Greece to receive the next tranche of vital bailout loans. “The next tranche is necessary in order to restore liquidity to the economy. It cannot delay. Even healthy businesses are threatened with failure and unemployment is growing,” Samaras said. On the issue of political corruption, especially in relation to a money-laundering case lately revealed in the press, Samaras said that the ‘zero tolerance’ policy for corruption still applied since ‘by leaving shadows we not only save the guilty but also tarnish [the reputations of] the innocent”. He emphasised that the best defence was to immediately shed light on everything and reveal the whole truth and stressed that democracy did not face danger only from its enemies but also from the negligence of those who were appointed to defend it. Government officials are bracing for another difficult week as negotiations on a tough austerity package with troika envoys are to resume and the tenuous stability of the three-party coalition is likely to be tested. Finance Minister Yannis Stournaras, the key architect of a proposed 13.5-billion-euro austerity package, is expected to meet Monday with envoys of the European Commission, European Central Bank and International Monetary Fund. 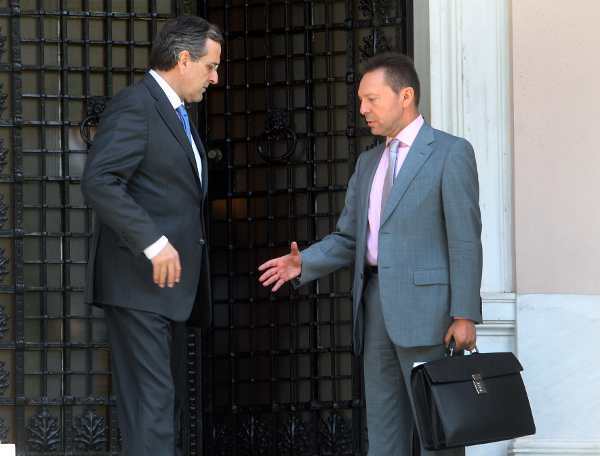 Troika officials are then expected to meet with Prime Minister Antonis Samaras and probably also with his coalition partners, Socialist leader Evangelos Venizelos and Fotis Kouvelis of the Democratic Left. According to sources, there is a sense of unease within the government due to a lack of insight into the intentions of troika envoys and mixed messages from Greece’s foreign lenders. There are fears, for instance, that the troika may draw out negotiations to give Greece’s EU partners and the IMF more time to decide how to tackle the Greek problem. There have also been some positive noises coming from Europe, with the German magazine Focus citing European Parliament sources as saying that Greece is sure to receive a much awaited 31.5-billion-euro loan tranche despite its failure to make good on economic reforms. It remains unclear however when the troika will issue the crucial report on which the release of this funding depends. In any case, government sources indicated to Kathimerini that a final agreement on the austerity package is unlikely before the end of this week, putting back the whole process. Meanwhile tensions are said to be simmering between the coalition partners despite their tentative agreement on the package. Venizelos has called for a decision on whether Greece is granted a two-year extension to its fiscal adjustment period to be taken in parallel to the approval of the austerity package — a demand that is said to have riled Samaras. Meanwhile Kouvelis is said to be on edge over the inflexible stance of the troika. It is unclear what his reaction will be if the envoys reject some of the measures and insist on immediate layoffs in the civil service. Apart from some 4.5 billion euros in cuts to pensions, 2.3 billion euros in cuts to civil servants’ salaries and benefits and 3.8 billion euros in cuts to state spending, the package also foresees the suspension of 15,000 civil servants up to the end of 2016 and 3 billion euros in new taxes. Greece!!! Get out of the EURO! Tora! You will lose your soverenty to the IMF Banksters who will Take all you have and enslave your people! this is a fact. Do what ICELAND DID. Tell the IMF to FATA! and print your own money at NO interest.